The title of the Gizmodo article “How DNA Testing Botched My Family’s Heritage and Probably Yours, Too”, screams out to DNA test takers: Danger Will Robinson! Oh, wait, that was something else. Still, the word botched implies that they’ve screwed up your results, but have they really? And, they aren’t the only one. Articles about how DNA tests are lying to us seem to be popping up all over the place. Your DNA test is not a fraud. However, you should understand that ethnicity estimates are called estimates for a reason. I’m no expert when it comes to genetic genealogy. I’ve done quite a bit of reading and I continue to learn as I go so as best to understand my DNA test results. This article sets you up to believe that DNA test are lying to you. They aren’t. But, the reality is this is a new science and there are many factors that can skew ethnicity estimates. Each company analyzes the data in a different way. Each company uses a different pool for its analysis. Each company sets its own criteria for determining ethnicity. Because of this, you are going to see variations between companies. Got that? Between companies, they use different methods because they haven’t settled on the one agreed upon approach to determining ethnicity estimates. Are you confused? Genetic Genealogy: The Basics and Beyond is a great place to start for understanding your DNA test results. Let’s look at some examples. The examples below are my ethnicity estimates from three different companies. First, let me explain what is known about my ethnic makeup. My Dad’s side is French, all from the same region of France. My mom’s father is Azorean, both of his parents were from Sao Miguel Island in the Azores. My mom’s mother’s side is more complicated. Her mother’s mother’s line is Irish, Welsh, and English. Her mother’s father’s side is English, but we know very little about this line. His parents could have been from anywhere for all we know. Read my post, “Harry Jackson, I Need to Talk to You” to see why. The first example is one of my very first ethnicity maps from FTDNA. Notice that the counties above are very well represented. The Finland at 3% is in the margin of error. Now, take a look at my more recent ethnicity chart from FTDNA. I lost the UK and Ireland and gained more Scandinavian. Do you see what happenedin between those two assessments? I lost my British/Irish heritage and I grew more Scandinavian. I didn’t lose any ancestors. Their analysis between updates changed. Now let’s look at how MyHeritage views my ethnic makeup. MyHeritage sees things a bit differently than FTDNA. 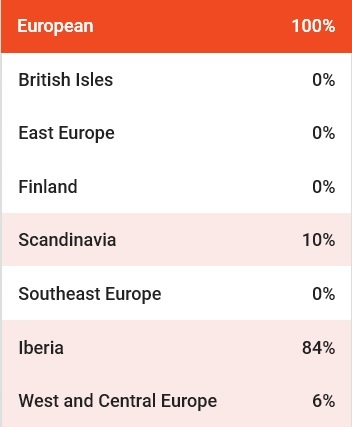 Although they match on Iberian, MyHeritage thinks I am 22.8% Scandinavian and 3% Italian. Rest assured, it does point out that I am 100% Melody Lassalle. What a relief! Finally, let’s see what GEDMatch has to say about things. GEDMatch gives you a variety of tools to work with. 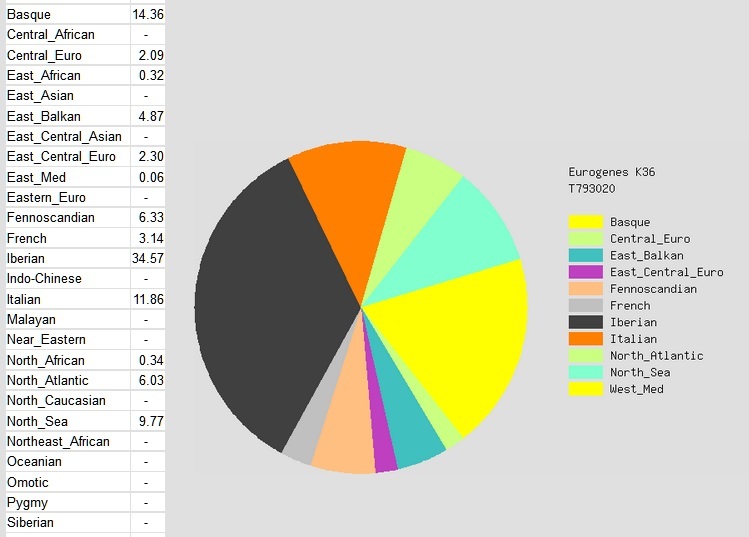 This chart was based on the Eurogenes K36 ethnicity tool. This breaks things down even more than FTDNA and MyHeritage. My Azorean and French are well represented within the Iberian, Basque, and French sections. 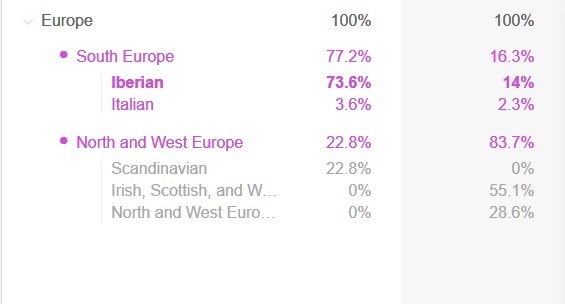 In this example, I have more Italian than at MyHeritage. The Scandinavian is still there under Fennoscandian. There are some groups not represented on the other charts. It has a smidgen of Balkans, West Mediterranean, and North Atlantic (Does this refer to the British Isles?) Most are within the margin of error. Just so you know, I tested at FTDNA, but uploaded my files to MyHeritage and GEDMatch. So, technically, this is one test interpreted three different ways. Shouldn’t Cousins Show the Same Ethnic Groups? This is where things get a little squirrelly. My inclination is to say yes, but it doesn’t always work out that way. MyHeritage allows you to see people’s ethnicity estimates side by side. Let’s look at how I stack up against my known third cousins. This is what MyHeritage thinks about our DNA. I am in the first column. He is in the second. Let me point out a couple of things. My third cousin and I are related through my mom’s maternal grandmother. We share the same great great grandparents. Our shared heritage is English, Irish, and Welsh. We only share one block of DNA on chromosome 2 (25 cM). Now look at the chart. Despite the fact that our shared DNA comes from only one chromosome sequence, our ethnicity estimates don’t match. Somehow, my cousin is Irish, Scottish, and Welsh, but I am not. I’m Scandinavian, but he is not. It doesn’t make sense to me and it probably doesn’t to you either. But, it is what it is. The ethnicity estimates are interesting. But, to really get the most out of your DNA results, look over your matches. Where are they from? Look over their family trees. Where were their people from? When I look over my DNA matches, I see what I expect to see. The family trees are filled with people who have French, Irish, British, Welsh, and Portuguese roots. When I look at the where my matches are from I see the places I would expect. I see the USA, Hawaii, Massachusetts, Canada, Brasil, France, Ireland, the Azores, Wales, Australia, and England. My matches tell me more about my ethnicity than my ethnicity estimate at this point. Except for the person from Iceland. How did that person get in there? My DNA Ethnicity Estimates Don’t Match, But, It’s Okay. No matter what the commercials say, DNA ethnicity estimates just aren’t there yet. There are discrepancies even between cousins on the same line. Your ethnicity matches people who are living in countries around the world right now. Those countries didn’t always exist. People moved around a lot due to famine, war, poverty, and other factors. They mingled, they bred. Their DNA reflects these factors–and they passed it down to us. The pools in some of those localities aren’t well represented either. They just don’t have data on every ethnic group we might fit into. Although this article is from 2013, “AncestryDNA Launches New Ethnicity Estimates” gives you an idea of how ethnicity estimates are determined and what groups can be represented in those genetic pools. Don’t fret over it! They will continue to improve on their methods. The more people who test, the better these estimates will become. For now, take your ethnicity estimates with a grain of salt. Don’t worry if they aren’t what you expect. Hopefully, with each update the companies will get better at it and the information will become more meaningful and useful. “How DNA Testing Botched My Family’s Heritage and Probably Yours, Too“, by Kristen V. Brown, Gizmodo. “Quaduplets Put DNA Heritage Companies to the Test” by CBS SF Bay Area.